Probable cause: So who’s behind the Western Cape train fires? 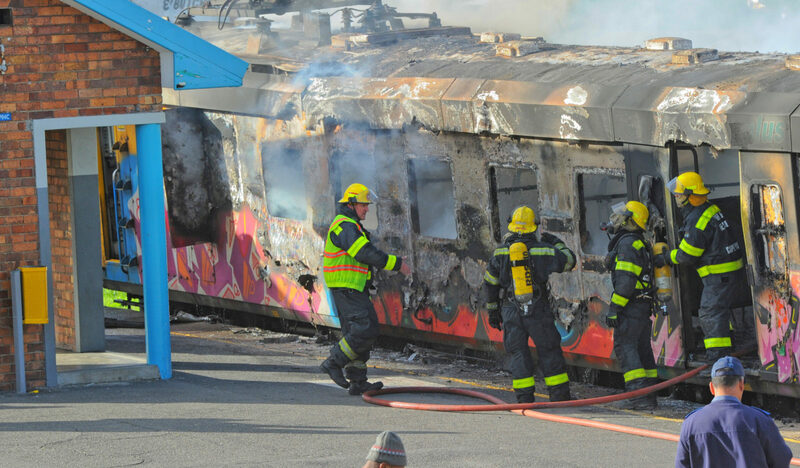 The City of Cape Town's Fire and Rescue Service responds to a train that was set alight at Steenberg Railway Station on June 18, 2018 in Cape Town, South Africa. No injuries have been reported and the cause of the fire is unknown. (Photo by Gallo Images/Brenton Geach). The Department of Transport, Prasa, Metrorail and Minister Blade Nzimande have, without question, allowed the burning of trains, stations and other infrastructure by their determined inaction. In 2016, Metrorail said that it was ‘under siege’ after another train fire in Kraaifontein. Since then the situation has only become worse. But how much worse? That’s 54 coaches burnt in less than 12 months. From 2015 to 2017 trains were burnt at a rate of three coaches a month. The past 12 months it’s been more than four-and-a-half coaches per month. As you can see from the locations, the increase has not been country-wide but has been disproportionately in the Western Cape, and it abruptly stopped on 9 October 2018.
Who is burning trains and why? On 1 February in Durban, it was a group of angry commuters due to significant train delays. On 8 May in Johannesburg, a faulty cable sparked a fire. In September in Strand it was an electrical fault. In Umlazi on 21 September it was a group of commuters angry over excessive delays. 15 October in Germiston, it was angry commuters after a train struck and injured a man. In these cases, the reasons were supplied to the media by the SAPS or Prasa. It’s not random. Metrorail operates in four provinces. No trains burnt in the two main Eastern Cape systems. (Buffalo City Metro and Nelson Mandela Metro). The SAPS, the Railway Police and private Prasa security, Prasa leadership and the Minister clearly don’t want the public to know who is causing the train fires in the Western Cape. In one or two cases, arrests have occurred. So where has the investigation into the circumstances around the arsonists gone? No one is talking. The police and security organisations know what happened in the cases in KZN and in Gauteng (except for one incident). They almost never “know” what happened in the Western Cape. There are patterns in the behaviour. Three trains burnt on one day in three different locations at roughly the same time on 28 September. This indicates the intention to send a message. It isn’t random. What is the message and to whom is it addressed? If there were no message, we would expect commuters to be angry on different days, on different routes and in different provinces. Are we supposed to believe that no trains are ever late or break down in the Eastern Cape? Eleven days later two trains were burnt in Cape Town Central station about three city blocks from Parliament where Prasa was giving answers on train burnings to Parliament. Coincidence? No train burnings have happened since. After many delays, the new railway security began operating on 29 October 2018. Paid for by the City of Cape Town, the Western Cape Government and Prasa in thirds. Trained by the City of Cape Town. So who could be orchestrating train burnings? They are clearly co-ordinated and not random. Who stands to gain? Bus or taxi operators who gain additional customers? Possibly, but too obvious. The train burnings are intended to attract attention, not to shift customers — too many were burnt on the same day. Bus companies or taxi operators would not wish to attract attention if they were behind train burnings. The same goes for companies who make money remanufacturing trains or conducting repairs. There isn’t a shortage of work, due to the age of the rolling stock and these companies wouldn’t want to attract attention. This leaves only three possible alternative role players: Workers in pursuit of a wage settlement had a wage dispute running most of 2018 at the CCMA — and Prasa was refusing to and delaying paying the settlement approved by the CCMA to about 200 workers. Prasa itself could be burning trains in order to gain the insurance payouts or to blame trade unions demanding unaffordable increases. Prasa is constantly short of cash and has to pay for new trains. But why stop on 9 October? The final alternative would be a large political party that is not in government in the Western Cape but would like to be. Here the ANC or the EFF would be the usual suspects. This is not impossible. However, why would they orchestrate the burnings to occur on the same day? This would make it easier for the police to identify the culprits. It also doesn’t explain 9 October. In the Western Cape, the number of serviceable trains has dwindled to below 40. A fully capacitated Cape Metrorail system would have more than 140. However, what the public doesn’t know is that Prasa has brand new trains sitting in a warehouse in Gauteng. They imported 20 fully built Alstom blue and white trainsets from Brazil. Their new plant in Dunnottar has begun building a further 33 trains for 2019 and more than 60 for 2020. These have to be paid for out of the fiscus, with the country running out of money, and Prasa barely able to meet its commitments. However, there will be no shortage of brand new trains in the near future. Prasa simply doesn’t have money to pay for security for the new trains. Rampant corruption and ineffectiveness have also been reported with regards to the private security and railway police paid for by Prasa. The new third security force on Metrorail Western Cape Routes together with drones, armoured vehicles and the like is now operational. Based on the patterns, the best guess is that workers in dispute were fuelling the fires, and the ANC establishment hushed it up because it suited them politically for Western Cape voters to be angry with the status quo. Ian Ollis is currently a candidate for the Masters of City Planning (Transportation) programme at MIT in Boston. He formerly served as a South African MP, (Shadow Transport, Labour and Education Minister). He has also worked as a city councillor in Johannesburg, briefly lectured at Wits University and ran a real estate company.